Custom embroidered scallop with your choice of color on the softest and most luxurious Egyptian Cotton sheeting or Fine Pique. The heavier weight Birdseye Pique and Diamond Pique fabrics are perfect for daily use. 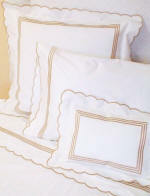 All Sheeting and Pique fabrics are available in White or Ivory. Sheet Sets include 1 Fitted, 1 Flat and 1 Pair of Cases. Twin Sheet Sets include 1 Single Case. See Size Guideline Below. Deep Pocket Fitted Sheets. 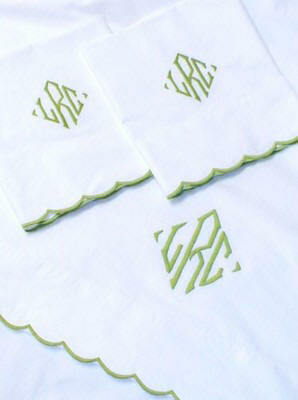 Shown here with 'Eric' monogram.